Singapore has installed electronic paper information boards at select bus stops across the city, joining the world metropolises that have already discovered the advantages of arrival information displayed on Visionect-powered energy saving tech. This time in color! Did you know that Singapore has one of the most widely used transport networks in the world? The public transport system in the city is the most important means for Singaporeans to get around, with half of the population utilizing it daily. That’s some 5.308 million trips per day! 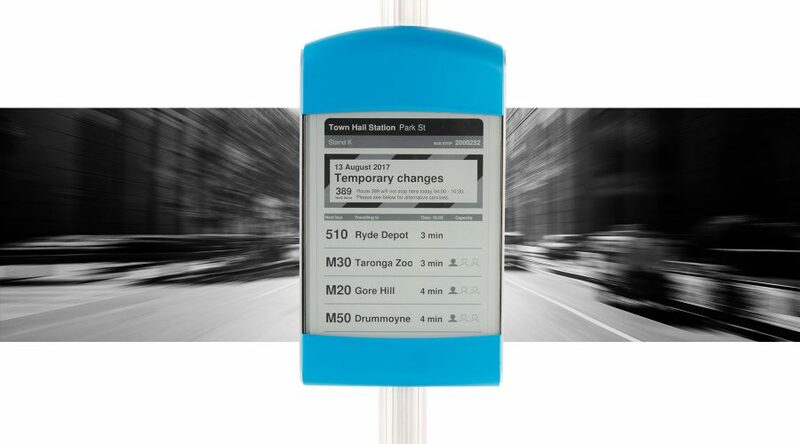 Vital in this mass transit are accurate public transport arrival times. Following in the footsteps of London, Orlando, Pittsburgh and Ljubljana, Singapore can now help its ridership through real-time arrival information displayed on electronic paper screens installed at select bus stops across the city state. Singapore’s Land Transport Authority (LTA) is now piloting the use of electronic paper for its information boards at 11 of the city’s bus stops. 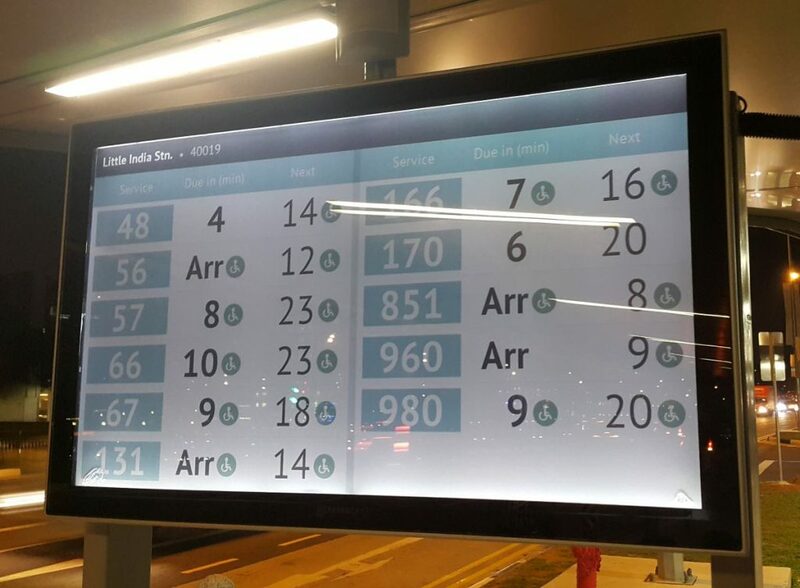 These were chosen for their high usage and now display real-time bus arrival information. As we wrote before, a good overview of the service offered allows public transport operators to take proactive control of their fleets, lowering operating expenses and providing a better service, retaining passengers. The choice of electronic paper to display the necessary passenger information in Singapore is clear: the technology is extremely energy efficient and runs on solar cells, completely independently from the electrical grid. Powered by Visionect electronic paper technology, the new Singapore bus stops are updated from a central location, connecting via the cellular network. Easily readable in direct sunlight, the 32-inch screens are illuminated with small LEDs installed at night to continue this ease of use. For the first time ever in e-paper used public transportation, the bus stop screens are in color. The color eink displays used in Singapore allow the bus operator to show different routes easily, color-coded and following the route patterns already familiar to the people using the transport. The LTA is looking to renew the display boards at 85 bus stops across Singapore, widening their use and modernizing up to 200 bus stops with the new features in the next few years. 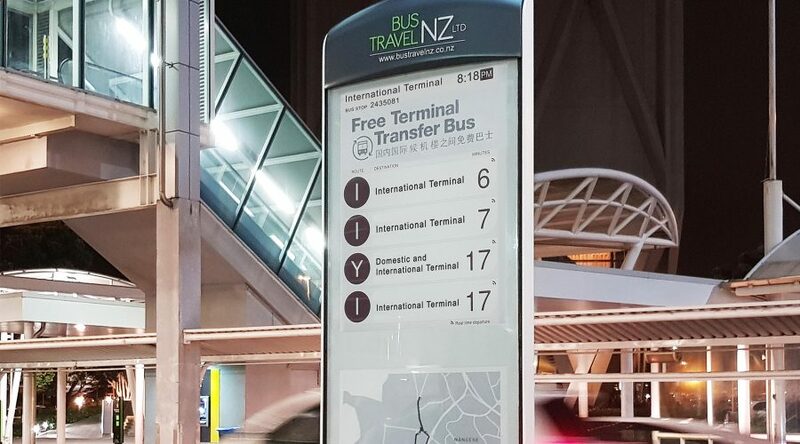 Following in the footsteps of London, Orlando, Pittsburgh and Ljubljana, Singapore can now boast real-time arrival information displayed on 32-inch electronic paper screens installed at select bus stops. 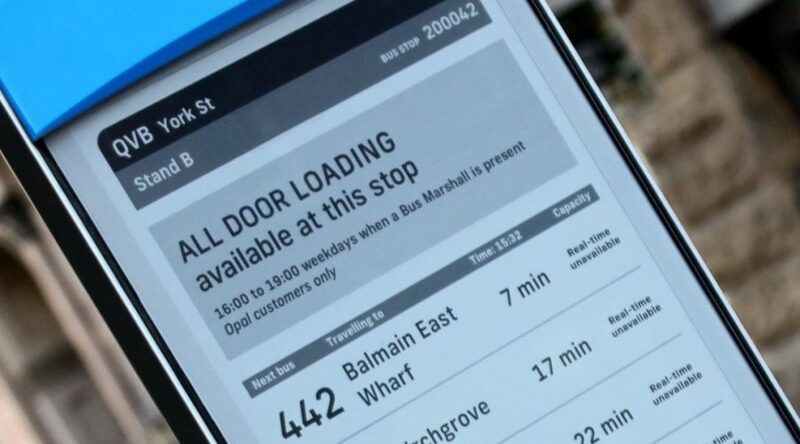 For the first time ever, this e-paper arrival information is presented in color.